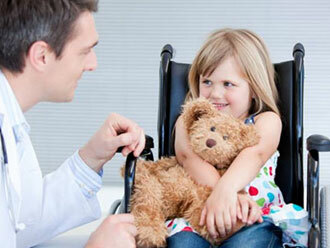 The Ringing Cedars - Articles: Cedar Nut Oil in treatment of Neurotic Disorders. The phytotherapy of neurotic disorders is traditionally appealing because of its gentle action, high degree of safety, and, as a result, the possibility of long-term use while maintaining a fairly high degree of effectiveness. Neurotic disturbances are accompanied by various somatic illnesses encountered in the practice of the attending physician. This is related to the unfavourable influence on the human organism of various factors, such as smoking, the use of alcohol, obesity, an unfavourable ecological environment, and negative industrial factors. The influence of these factors sharply lowers the resistance of the organism to the effect of physical and mental loads, and in the final analysis reduces one's ability to work. In the case of a lengthy, chronic influence, disturbances of the cardio-vascular and nervous systems develop, immunological reactivity is lowered. A disruption of the nervous system leads to the development of such pathological conditions as anxiety, depression, sleep disorders, and other neurotic reactions, right up to panic attacks. The preventive treatment of neurotic disturbances is an essential therapeutic action for persons from a similar risk group. The Siberian cedar is a symbol of strength, longevity, and stability. Even by simply entering a cedar forest we feel that it has become easier to breathe, gloomy thoughts disappear, and we feel inwardly at peace. The main virtue of the Siberian cedar is its seeds (nuts). For a long time, the collecting of cedar nuts has been considered one of the more important industries of the residents of Siberia and the Urals. The cedar nut oil extracted from the nut has from the earliest times been considered a delicacy. 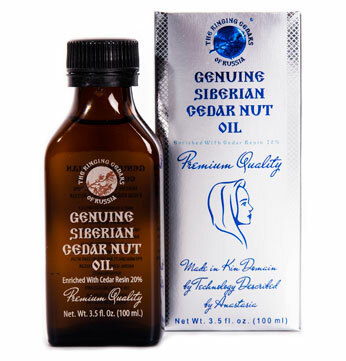 The oil of the Siberian cedar nut is a natural product made in Russia. Siberian cedar nut oil bearing the Ringing Cedars of Russia trademark is obtained by the method of the cold pressing of choice nuts according to a technology that is preserving, which retains all the beneficial properties of the oil endowed by nature. Siberian cedar nut oil is a thick transparent fluid, its colour is light yellow or golden amber, it has a wonderful nutty aroma. Siberian cedar nut oil can replace any vegetable oil - sea buckthorn, burdock, coconut, olive, almond, and others. But it is impossible to replace cedar nut oil in all its value. The biological value of Siberian cedar nut oil is determined by the high content of the following in its composition: - polyunsaturated fatty acids (linoleic, linolenic, oleic), no less than 60%; - vitamins of the groups A (carotinoids), B1 (thiamine), B2 (riboflavin); - irreplaceable amino acids; - vitally important trace elements (iodine, phosphorus, potassium, magnesium, manganese, copper, zinc, cobalt, and others). Siberian cedar nut oil is a natural concentrated source of vitamin E and polyunsaturated fatty acids, which are not synthesized in the human body and must enter the body only with food. 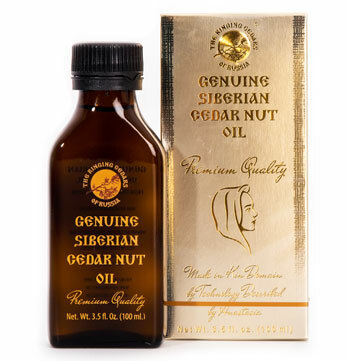 The high medical value of Siberian cedar nut oil bearing the Ringing Cedars of Russia trademark is corroborated by its chemical compositions. It exceeds all known oils in quantity of phosphatidic phosphorus. This is a valuable nutritional product that has a positive effect on the human body owing to the content of magnesium, which is irreplaceable in the treatment of disorders of a neurological nature. Magnesium possesses the ability to dilate the blood vessels and reduce the heightened excitability of nerve cells. Vitamins of the E group have a high oxidant activity. The positive influence of vitamin E on the functioning of the sexual and other endocrine glands is widely known. Vitamin A has an influence on the growth and development of the body, and increases the immunological resistance of the body in many infections. It is well known that a chronic deficiency of polyunsaturated fatty acids and vitamin E can be the cause of the development of atherosclerosis, diabetes, skin disorders, chronic fatigue syndrome, and the premature aging of the body. Supplements of these components, which are contained to a sufficient degree in cedar nut oil, enable the conditions in questions to be prevented and treated. Siberian cedar nut oil bearing the Ringing Cedars of Russia trademark is used in the treatment of many disorders, it is an effective natural antioxidant. It is widely used in neurology. In the first place, it is indispensable for those people who lead an active lifestyle and are in a state of psychological and emotional stress on a daily basis. Taking Siberian cedar nut oil assists in eliminating chronic fatigue syndrome, increases the adaptive capacities of the body, it has a general fortifying effect, improves the composition of the blood, promotes an increase in the level of hemoglobin, and regulates lipid metabolism, owing to the normalization of the lipid profile. Siberian cedar nut oil is recommended for the normalization of the activity of the nervous system: to slow down the aging processes, and maintain a high capacity for work and state of well-being into extreme old age. Recommendations for use: one teaspoon two to three times a day, with meals, which ensures an adequate level of the requirement of polyunsaturated fatty acids at 22% (12.5 g), vitamin E at 20% (2.0 mg). The course of treatment is one month. A noticeable therapeutic effect usually occurs even after two weeks of use. For the treatment of neurological disorders, Siberian cedar nut oil is also used in the form of external applications. For example, in the comprehensive treatment of neuropathy of the trigeminal nerve, the external cutaneous nerve of the thigh, the glossopharyngeal nerve, intercostal neuralgia, and other disorders accompanied by the pain syndrome. At the sign of the first symptoms of neuralgia, a small quantity of oil should be rubbed in the area of the severe painful sensations. The greatest effect may be obtained if a bath is taken first, or the painful area is heated, in addition it may be combined with the oils of cloves or rosemary in equal proportions.